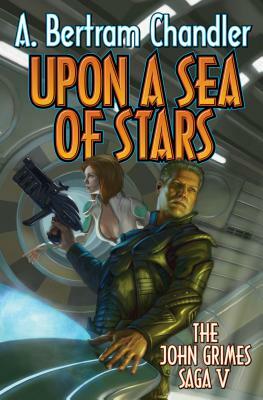 The fifth omnibus edition of the classic science fiction of A. Bertram Chandler's John Grimes books and stories in this renowned SF space-faring saga. Contains Into the Alternate Universe, Contraband from Otherspace, The Rim Gods (1969)--a story collection, The Commodore at Sea (a.k.a. Alternate Orbits, 1971)--four novellas. Pipe-smoking, action-loving spaceship commander Lieutenant John Grimes (think Captain Kirk with more of a navy, salty attitude) moves out of the Federation navy and finds his true calling adventuring along the spaceways of the galactic rim. A. Bertram Chandler was an Australian SF master who filled magazines such as Astounding with adventure and space opera extraordinaire from the 1940s into the 1970s. He was a favorite of legendary editor John W. Campbell and was a merchantman seaman commanding various ships in the Australian and New Zealand navies during much of his early life--a background Chandler puts to full use in his John Grimes stories.